I feel the same way about powder foundation as I do about online dating. Sure, there’s a chance the date could be great, but there’s an even bigger chance that the guy won’t match up with his pictures, or he’ll show up in a t-shirt that says, “Poke Me” (that actually happened to my sister recently). I love the idea of powder foundation, and I’m always excited when I find a good one, but because of my dry skin, powder foundations often emphasize dry patches and settle into my fine lines. For this reason, I proceeded with caution when the new Kat Von D Lock-It Powder Foundation was released. Most of what I’d heard about it was positive, and though I was 95% sure it wasn’t going to arrive in an inappropriate t-shirt, I was still afraid it wouldn’t live up to my expectations. Kat Von D Lock-It Powder Foundation ($34) is a pressed powder foundation that promises buildable coverage, a flawless, matte finish, and 24-hour wear. 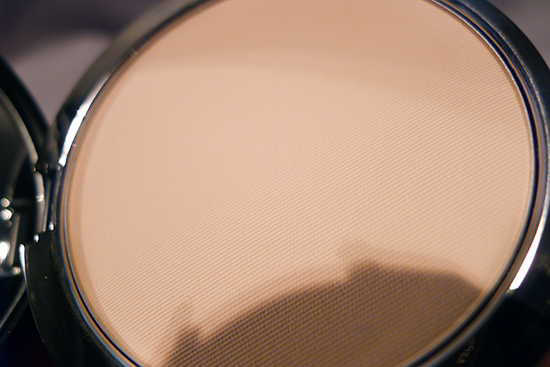 It claims to be both smudge-proof and sweat-proof, and resistant to caking or creasing. This foundation has a pretty decent ingredient list. It contains no fragrance and no pore-clogging ingredients or major irritants, which is great for people with sensitive skin like myself. The downside is that it does contain talc, which is fine for most people, but there is a small part of the population that is sensitive to it. If you’re part of that group, you’ll have to skip this foundation. There are no major red flags in this ingredient list according to COSDNA. 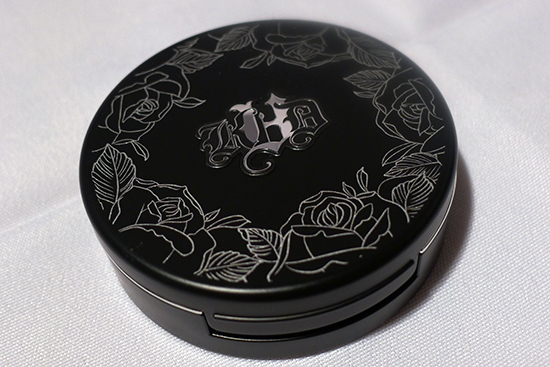 Kat Von D Lock-It Powder Foundation comes packaged in a cute little compact with an elaborate Von D style design on the cover. It has two compartments – one to hold the powder and one to hold the sponge applicator that comes with the product. I like the concept, but the top compartment (which holds the powder) does not have any sort of mechanism to help it stay in place when the compact is open. Because of this, the top part of the compact lifts automatically when it’s opened, and even once I push it back into place, it tends to pop up a little as I’m applying my makeup. It’s not a showstopper, but I do wish it had been thought out a little better. 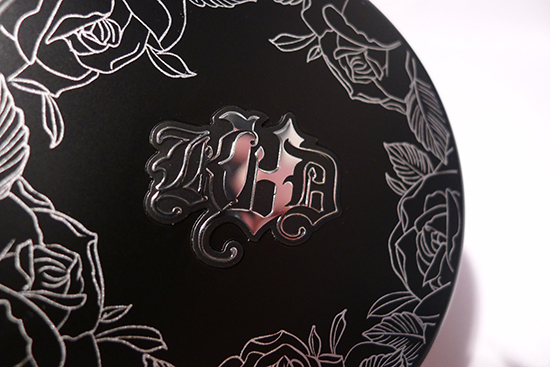 Kat Von D Lock-It Powder Foundation has no notable smell, and contains no added fragrance ingredients. I’m not a big fan of sponge applicators for powder foundations, so I apply Kat Von D Lock-It Powder Foundation with a brush. I have multiple brushes that do the job beautifully, though my favorite one to use with this powder is my Hakuhodo G527 Powder Brush. I’ve also gotten great results with a Sigma F84 Angled Kabuki, a Sigma F82 Round Kabuki, and the Chanel Les Beiges Retractable Kabuki. 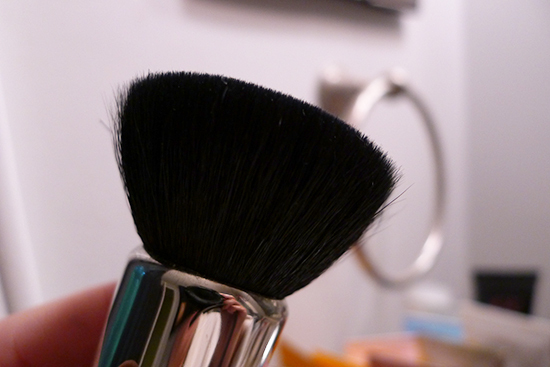 This is my favorite brush for applying this foundation – the Hakuhodo G527 Powder Brush. After waiting for my primer to set (I use Hourglass Veil Mineral Primer), I apply this foundation by sweeping the brush over the top of the compact, gently spreading the powder over my skin, then buffing until everything is smooth and I’ve got the coverage I want. I work in medium sized sections of my face. The whole process takes maybe 3 minutes, tops. Because it’s a powder foundation, I can skip my finishing powder and move straight into applying my blush and highlighter. My overall makeup routine takes a lot less time when I use this foundation! I love the finish and coverage of Kat Von D Lock-It Powder Foundation. It feels really light on the skin even when I’ve applied enough for full coverage. However, I generally go for the upper-end of medium coverage with this – any more than that, and the coverage starts looking overly powdery on my dry skin type. My medium-plus coverage does a good job covering any acne marks, and looks smooth and matte without appearing unnatural. 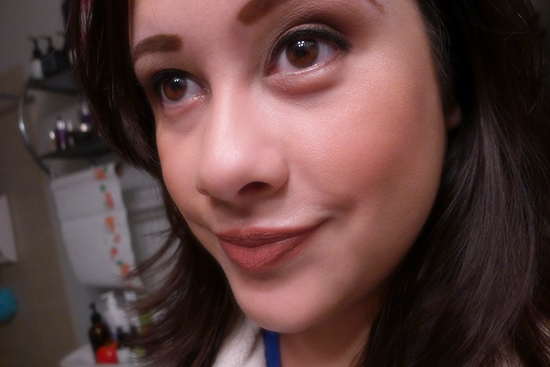 In terms of longevity, Kat Von D Lock-It Powder Foundation really does last all day! I am surprised by it every single time I wear it. When I come home from work, my makeup looks almost as good as it did when I left in the morning. My skin type is dry, however, and though this doesn’t settle into fine lines with the same severity as other powder foundations do, I do find that the expression lines around my eyes are a little more prominent by the end of the day. It’s not terribly noticeable, but still worth mentioning. I’m not sure about 24-hour wear – there’s no way I would ever purposely wear makeup for that long. But I can attest that this foundation still looks great after 10 hours, and that’s plenty good enough for me! No foundation – freshly moisturized, sunscreened, and primed. 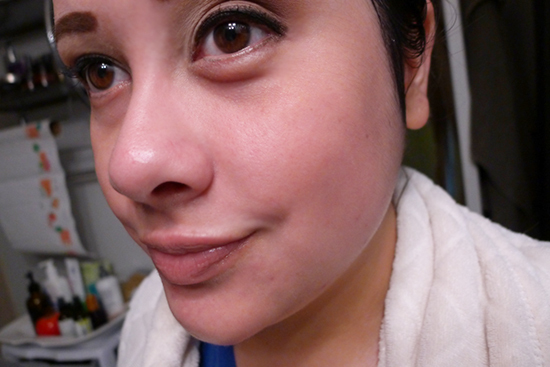 Moments after applying Kat Von D Lock-It Powder Foundation in Light 44. 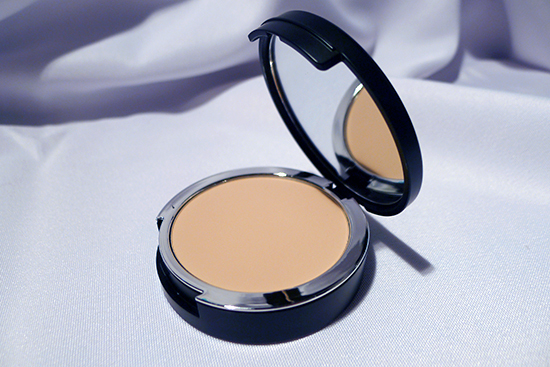 The biggest risk with my dry skin and powder foundation is flaky, dry patches. I have not experienced any flaking at all when wearing this powder, which is pretty impressive! 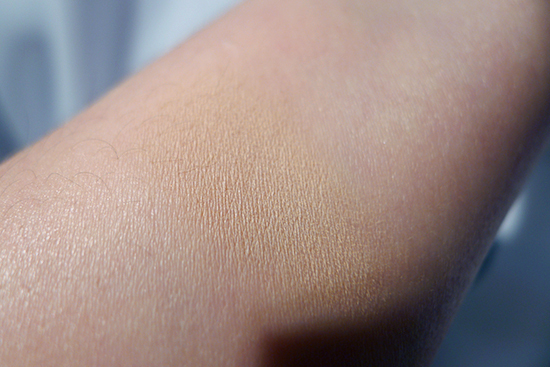 Not everyone will be so lucky though – my sister also has dry skin that comes with a couple of textured patches that show up with most powder foundations, this one included. Her patches are not the usual dry skin patches though – they don’t flake, they don’t feel dry to the touch, and they aren’t visible unless she’s wearing a powder. It’s a strange anomaly, but worth stating for anyone out there with a similar issue. I’ve read a handful of reviews on the Sephora website saying that this foundation oxidized on some people. I have not personally experienced any oxidation at all with this product. However, I will say that the color range in the Kat Von D Lock-It Powder Foundation does not match up with the liquid foundation. In the liquid foundation, I am a Light 48. The Light 48 is too dark for me in the powder foundation, but Light 44 is a perfect match! The downside of this is that Light 44 is the lightest shade, so if you are any fairer than NC15 or NW13, this powder will be too dark for you. 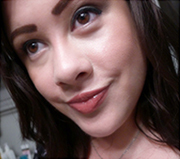 I’m a huge fan of Kat Von D Lock-It Powder Foundation. I’m not normally into powder foundations because of my dry skin, but since I picked this one up, I find myself reaching for it more often than any of my other foundations. Its quick application and all-day wear make it an easy choice! Performance: 5/5 – Long wearing, looks fantastic, not too drying, and easy to work with. 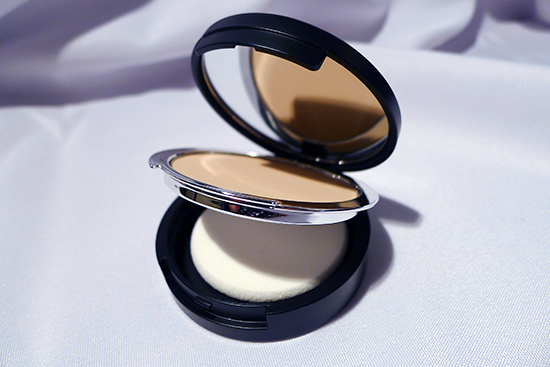 Value: 5/5 – I’ve tried a lot of powder foundations at a lot of price points. This is the best one I’ve tried, so $34 seems like a deal to me! Kat Von D Lock-It Powder Foundation is a Sephora exclusive, where it retails in-store and online for $34. I have light 45 which ( I believe) has yellow undertones and I love it. My skin is combination/super oily and this stuff, when properly buffed in looks fantastic! I did have an issue with it when I applied it over my shesiedo cream spf 50 sunscreen. 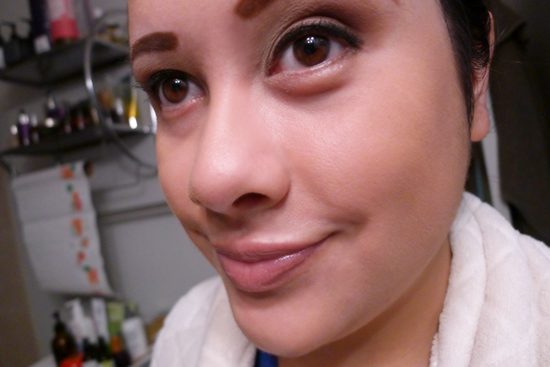 It clumped up in places and looked bad but still a great powder foundation. Good to know about the Shiseido sunscreen bit! What kind of brush do you like to use for application? Light 48 translates to Light 44 in the powder? That sounds about right. It was a bummer for me, since I was Light 44 in the liquid which means that the lightest shade of powder is SUPER SUPER dark. Ugh, yeah, I can imagine. That blows! You know, I recently tried Light 45 too, and it actually seems to be a lot lighter than Light 44. The undertone is more yellow but it’s not over the top. Any chance you’re neutral enough to pull that off? Just wondering if you know what shade at MAC you are?? This way I can compare and see if this shade is right for me! Hello! I’m planning to buy this. However, lot of reviews said that the shades are not same as for the tattoo foundation. I am medium 53 in the tattoo foundation. What do you think should I get? I’m also looking for same warm undertone, 54 is neutral while 56 is cool. So i thought maybe 57. But I couldn’t find reviews and pictures that really shows the shades I think I need. Thanks! !